The distance of closest approach of hard particles is a key parameter of their interaction and plays an important role in the resulting phase behavior. For nonspherical particles, the distance of closest approach depends on orientation, and its calculation is surprisingly difficult. Although overlap criteria have been developed for use in computer simulations [ Vieillard-Baron J. Chem. Phys. 56 4729 (1972); Perram and Wertheim J. Comput. Phys. 58 409 (1985)], no analytic solutions have been obtained for the distance of closest approach of ellipsoids in three dimensions, or, until now, for ellipses in two dimensions. We have derived an analytic expression for the distance of closest approach of the centers of two arbitrary hard ellipses as a function of their orientation relative to the line joining their centers. 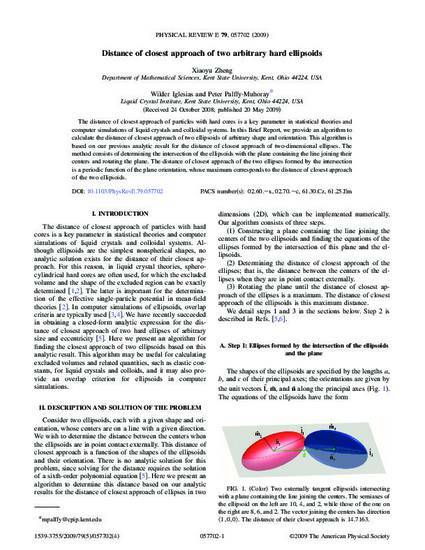 We describe our method for solving this problem, illustrate our result, and discuss its usefulness in modeling and simulating systems of anisometric particles such as liquid crystals. Copyright 2007 American Physical Society. Available on publisher's site at http://dx.doi.org/10.1103/PhysRevE.75.061709.